Omatsuri Danshaku to Himitsu no Shima (Baron Omatsuri and the Secret Island) is the sixth One Piece movie and differs in many aspects to the series in terms of animation, sound and character. I have to say now &ndash; if you like One Piece for it&rsquo;s fighting &ndash; look elsewhere, this film is all about adding depth to the emotional bonds of the crew, which is picked upon during major arcs in the series, and how important nakama are to everyone. Whilst sailing the Grand Line the Mugiwara pirates come upon a message in a bottle, advertising Omatsuri Island (Festival Island), a pirate paradise. But when the crew reach the island eager to kick back and relax, they are propositioned to go through &lsquo;Ordeals&rsquo; (much like the Skypiea arc) that are all based on Japanese festival games (goldfish catching etc). 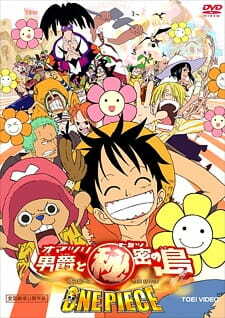 Luffy, forever positive, is happy to participate in the &lsquo;games&rsquo; while the rest of the crew slowly start to fall apart. Compared to the series, this movie is much more mysterious and, at times, even unsettling, especially towards the end when everything becomes desperate. I&rsquo;ll leave the Story at that, not wanting to spoil anything. I noticed the art straight away and it first I thought it was just for the opening, but it stays throughout the whole anime and fits perfectly for the more serious tone. The characters are still drawn the same way, but there isn&rsquo;t any cell-shading (y&rsquo;know that band of light anime characters get across their hair? Yeah, there&rsquo;s none of that), it gives a more &lsquo;flat&rsquo; and simple look. Computer animation is also used quite a lot (backgrounds, weapons, plants, goldfish..), especially when they first arrive in the island and are moving through the jungle. It jarred me at first, but eventually I started to like the 2-D characters against a computer animated 3-D background, it some ways it made up for the lack of colour the characters had. There are also other things in this movie which you wouldn&rsquo;t find in the series: a First Person Perspective &ndash; there are a lot of times where you hear dialogue but you don&rsquo;t see our characters. Sanji also breaks the fourth wall a few times (turning to the viewer and speaking to them) early on. Where do I begin? I think after the art, the sound is something easily noticed. I cannot express how much I adored how the sound was used in this film, rather the background music or lack thereof. During the opening, there&rsquo;s some steel drums and very &lsquo;Caribbean&rsquo; music &ndash; highlighting the fact that the Mugiwaras are heading to a paradisiacal island (this actually reminded me of a certain Disney movie &not;_&not;). I can&rsquo;t really remember any distinct scores of music in the film, but that&rsquo;s probably because there are massive gaps of silence in the music. I loved it. It&rsquo;s common that during a film we&rsquo;re subconsciously affected by the soundtrack, it&rsquo;s even more common that we can&rsquo;t remember things like background music unless it&rsquo;s highlighted. In this film, the lack of music really works; it makes us focus our attention on the characters and their expressions, their emotions and conversations. Often, the camera would be fixed on a character for a number of seconds with no dialogue or music, and even no real animation. It can feel a bit strange at times because you end up thinking to yourself &ldquo;It would be more interesting if they were actually doing something&rdquo; but looking back it enhances the overall style and feel of the movie. As usual, the seiyuus of One Piece are brilliant. This is probably the most important aspect of the movie, as in most movies that are based off a series; you need to be able to introduce your characters effectively for the familiar and unfamiliar audience. Within the first five minutes, we are shown all of the main characters personalities and desires quickly, whether it be Sanji&rsquo;s affection for beautiful women or Nami&rsquo;s for luxuries, Usopp&rsquo;s &lsquo;cautiousness&rsquo; or Zoro&rsquo;s aloofness. For an unfamiliar viewer it helps you understand who these characters are, and their motives, for the familiar viewer, it&rsquo;s fun to see the characters basic urges being poked fun of. I&rsquo;d say through the film we see (without trying to spoil anything) a different side of the characters, or at least in their attitude towards each other. Misunderstandings occur, arguments happen, crew members go missing and suddenly everyone&rsquo;s fighting with each other. If, like me, when you watch One Piece&rsquo;s emotional scenes (the character&rsquo;s pasts, Luffy and Usopps fight etc) you actually feel for the characters, you cheer Luffy on, and when your favourite is beaten, you feel beaten too, this movie will get to you. The sight of the main characters drifting apart is painful and you think &ldquo;What are doing you idiots? You&rsquo;re nakama!&rdquo; &ndash; that is the key to this whole film. To touch upon the new characters that are solely in this film, they all have their own charm &ndash; I found Brief endearing and funny, the Tearoom pirates, despite their smaller amount of screen time, managed to have their own story and a family dynamic. Finally, Baron Omatsuri and the rest of the Island&rsquo;s inhabitants are probably the most difficult characters to talk about. Personally, I probably felt more pity for them than anything else, despite the Baron being the &lsquo;villain&rsquo;. Characters like Muchigoro and DJ had the strange ability to invoke fear and sympathy at the time, I found it hard to completely dislike them even though they were the enemy. Briefly, everything I love about One Piece was in this movie &ndash; the characters, the humour and the usual emotional nakama-related plot. If you enjoy One Piece for the same reasons, I highly recommend you watch this. I would even perhaps recommend this to people who haven&rsquo;t watched the series, but I doubt it would have the same impact as it would for fans. Thank you for reading, please feel free to send me any feedback etc. At first when I saw this I was suprised, mainly because the art style was so different, it was anyhting but original one piece style, it was really different, the animators mixed in CG and 2d together into this movie, and I felt they did a brilliant job,. The story and the setting and even the personality of the characters really help to set in the art style. and it really does help to show how the characters reactions and feelings begin to shift in the story. The story was weird at first, but it almost immediately begins to make sense. the action in this movie was decent and very enjoyable, especially the finale, which I really enjoyed, that scene just engraved itself into my head. OVerall the story was more of a ghost tale, but at the same time it also held a important message of freindship. which I also enjoyed. the voice acting was brilliantly done as usaul, and the character were well thought out. Overall I enjoyed this movie, more then some of the other one piece movie releases mainly because of the difference in the style and maybe due to the story itself, either way I really enjoyed it and have found my self rewatching it for more then 7 times. Hungry for some One Piece with a little twist? Look no further, because here it is. On one hand I quite liked the story. The Strawhats, as always, are out on an adventure. It is wacky, funny with some slapstick and the good old jokes. On the other hand the story is different from the usual One Piece we know, this is both good and bad as the story becomes interesting, but I will try to write them in a list. - the plot twist also makes the movie seem like another movie altogether. The tone, so to say, change drastically and magnificently. - Plot holes. In the end this alternative story is indeed refreshing, but it does leave some things unexplained. The art is wholly different from the standard One Piece art, but this is not necessarily bad, I just find it to be bad in this case. Both the background and the characters, especially the expression on the crews faces is different. Much of the story has buildings in its background, and those are amazing to look at. The things is though, that they are too different from the characters design, it just does not mix well together, at times it looks as if the characters has been plastered on. The expressions and characters designs seen one the crew is refreshing. The expressions seem more cartoonish to me, a big plus. The music used is a mix of the standard from the series and and some original mixed together, they mix okay together. The voice actors also do a pretty good job. In short I found the sound to be the most satisfying in the movie. The characters could have shined in this movie, but ultimately failed to do so. The movie put the Straw Hats up against each other, but fail to do it trustworthily, as they act out of character and the conflict is never resolved, it simply disappears. All in all this movie has it shortcomings, but it does not fully take my joy from watching this movie. It was pleasing to see a different story, even if it did not fully do its job. Please read further at your own risk since this review contains SPOILERS. Also. my memory’s a bit hazy since watched this movie a little over 2 weeks ago, so please correct me if I’m mistaken in any part. At the time of writing this review, I have not watched the top 2 rated One Piece Movies (One Piece Strong World and Film Z). Hence I’ll claim this movie to be my favorite movie amongst the One Piece movies so far because others have their eyes on adventure as the main theme, which for me is average. When I first saw the cover of this movie on MAL, I was sure that it would be really crappy. I was also surprised to see how high this movie is rated compared to other OP Movies. But as the mainstream saying goes, “Don’t judge a book by its cover”. One Piece has always been known for its adventurous world, light hearted comedy (which sometimes isn’t funny) and its focus on friendship between the crewmates. This movie takes it one step further in terms of friendship between the crew. It does have a few plot-holes though. To begin with, the movie starts out pretty average as you have the Straw Hats sailing the sea and finding a mysterious island. On the island they meet the island inhabitants and are put through a series of games to determine if they get to stay on the island. That’s all I can describe about the introduction. Midway, chopper separates from the crew as he isn’t participating in the games. He meets a father and his daughters who tell him that Baron’s (King-ish person of the island) main goal is to separate and destroy the friendship among pirate crews. Baron spies on them and shoots Chopper with a tranquilizer which causes him to lose consciousness. Meanwhile Zoro + Sanji and Nami + Ussop compete against Baron’s friends in the games. If you watch One Piece, you know that Zoro and Sanji never get along. Nami and Ussop also get tricked by the competitors when they set up Ussop so that Nami thinks that he betrayed her. This movie is the outlier amongst other One Piece movies as the story’s core focus isn’t adventure this time around. Instead, this story touches a deeper topic, which is the bonds between the Straw Hat Crew. From my point of view, I felt like the story was very dark and has a sense of true mystery in it. The movie begins with below average animation and deformed characters in some frames (almost like the animation in OP Chopper Special, but tad bit better). The character outlines are very thin, and the colors used are a little darker. It appeals as a comedic movie in a sense actually. But as it progresses, you’ll start to understand why they used this kind of animation. One of the last scenes especially was very well done, where the flower on Baron’s shoulder transforms into this gruesome thing. No comments about the music since I can’t seem to recall it. The focus on characters was intense in this one. It also tells you about Nami’s nature, because she refuses to let Ussop talk and explain himself (that he was set up by Baron). Ussop inturn also gets upset with her and stops talking to her. Zoro and Sanji, fiesty as always against each other. These four, thinking about each other’s betrayal, also get aggressive with Luffy when he tries to council and talk to them. Robin and Chopper were solo and got abducted, so nothing to elaborate on about them. In the end, you get a great fight, Luffy vs Baron. The fighting sequence is very well done and is really immersive. I absolutely loved the nature of this movie. It’s quite dark-themed, mysterious and focuses on a sensitive topic. I’d recommend this movie to OP fans looking for something a little different from the other OP movies. Mamoru Hosoda: The Next Miyazaki? Mamoru Hosoda makes heartfelt, beautifully-animated films that appeal to all ages. His latest, The Boy and the Beast, is coming soon to theaters in America and Australia! Learn how he got to the point where many have called him "the next Miyazaki."